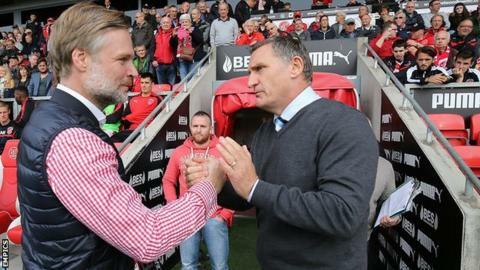 Former Coventry City manager Steven Pressley, now boss of Fleetwood Town, says he was impressed by the Sky Blues in Saturday's home defeat at Highbury. Pressley, appointed last week, took charge of the Cod Army for the first time against Coventry in League One. It ended cruelly for Pressley, and especially ex-Sky Blues defender Richard Wood, who put through his own net in the last minute in a 1-0 defeat. But Pressley said: "They look strong. I'm pleased to see them doing so well." He told BBC Coventry & Warwickshire: "My staff in the office after the game said they're the strongest side that we've faced this season." All three of Fleetwood's managers in the Football League have been Scottish. Paisley-born Micky Mellon led the Cod Army into the league for the first time in 2012. He was then replaced by 40-times capped former Scotland right-back Graham Alexander, who was replaced last week by his former international team-mate, Elgin's Pressley. Pressley, who took his former Sky Blues assistant Neil McFarlane with him to Lancashire, added that he was touched by the "wonderful reception" that he had from the travelling Sky Blues supporters. "I had a good rapport with the fans," he added. "They appreciated the work we did and were very understanding over the challenges we faced. "I like to think we put the foundations in place there. We got the club to a position from which they could build on." Coventry boss Tony Mowbray felt that the extra expense of travelling to Lancashire the night before the game was justified by the hard-working performance his side produced to end City's run of three away games without a win to climb to fifth in the League One table. "We've taken the money out of the playing budget to do that," he told BBC Coventry & Warwickshire. "But it's an important part of football. "We spent three hours on a coach going to Yeovil last Tuesday night and you could tell. We're doing it to make sure the players travel well, eat well and prepare well for games. It's not like we've found any more money. "We're potentially having to do without a player but it give us the best chance to perform, so credit the administration for allowing us to do it." Read more on Fifa: Sepp Blatter & Michel Platini banned - is this the tipping point?